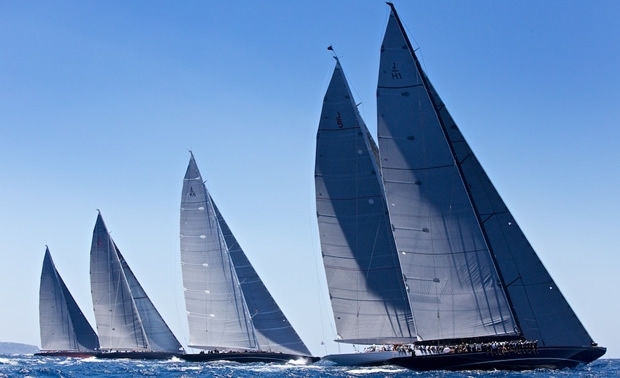 The first day of the Superyacht Cup proved to be a fantastic opportunity to showcase the powerful Js. Conditions in the bay of Palma were predictably perfect with the early afternoon sea breeze averaging 15-19 knots and wave height of only 1.5m, a contrast to the last battle of the Js in St Barths – teams today were anticipating that the flatter more protected sea would provide a more level playing field where tactics and team work would be paramount. An all clear start at 1.05pm for a three lap windward-leeward, with Lionheart taking the windward end of the line. The right hand side of the course seemed to pay off for the first beat, and indeed for most of the race. Those that headed towards the Cathedral seemed to have the advantage. Lionheart led Hanuman around the first mark, and it was a tight pack that followed with only boat lengths between the five Js. At the first downwind gate it was neck and neck between Hanuman and Lionheart on the rounding, however on the second beat Hanuman gained a steady lead favouring the right hand side of the course. Nearing the top windward mark, Hanuman was nearly a full ten boat lengths in front of Lionheart, before Lionheart unfortunately had an issue with her jib enabling the rest of the fleet to catch up and give Hanuman the clear lead. Second around the mark was Velsheda, followed within seconds by Rainbow and Ranger; Lionheart was quick to rejoin the race, although now at the back of the fleet. The second downwind leg saw another movement in the positions, Hanuman still in the clear, but Ranger again taking the preferred side of the course took second round the mark from Rainbow by a close 30 seconds. Velsheda, with a torn spinnaker meant that she was last through the gate. Up the last beat, Ranger kept a good four boat lengths over the remaining fleet, covering Velsheda as she tacked over. At the last windward mark, Hanuman retained first, followed by Ranger four minutes later. The tussle was now on between Rainbow, Lionheart and Velsheda, who were covering tack for tack. The last downwind leg was glorious, a true spectacle that all had come to be party to. It was a close race, after two hours all five Js crossed the line within five minutes of one another. On corrected time Hanuman won by one and half minutes, Ranger took second with the closest finish between Lionheart and Rainbow whose positions were reversed on handicap with Lionheart taking third by eleven seconds. Tomorrow, the Js have another windward-leeward race followed by two coastal races on Friday and Saturday.